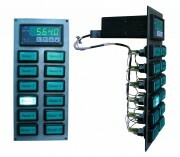 Temperature and other parameters (pressure, level, consumption) measuring and registration. Measured values are displayed on TFT touch operator panels as tables, charts, diagrams, symbolic circuits. Collection and archiving data received by RS-485 interface (Modbus protocol). Data displaying on operator demand. Up to 16 buttons. Possibility to use remote indication units BVI-TK-2.